09-Nov-2014 -- As I was in the area supporting the use of geotechnologies in education, including presentations and meetings at Texas Tech University, All Saints' School, and Lubbock Independent School District in Lubbock, along with a meeting in Odessa, a confluence visit seemed like the perfect capstone. Would I make it to 33 North 103 West in time to then drive to Lubbock to catch my flight out of the region? After visiting 32 north 102 west in late morning, I drove around Midland's east side, northwest to Andrews, where I photographed a 1970s style motel in excellent condition. After nearly getting run into by another vehicle on the north end of town, I drove north to Seminole, then northwest to Denver City, all the while under bright and breezy Texas skies. Upon nearing Denver City, I was greeted with views of hundreds of oil and natural gas drilling rigs. Once in town, I turned to the west, past cotton fields and a real cotton mill complete with piles of cotton and cotton seeds. At Edwards Road, I turned north, drove through grasslands to 350 Road, and then west on this road to a large shed that I had identified earlier on the satellite image. I pulled over to the north side of the road and stopped there, being careful not to block access for the landowner. I backed up and then forward, so I would be facing the road. I got out and gathered supplies. No more than 5 meters after I began walking, and indeed, as I was still looking at my x-y position on my phone and on the GPS receiver, I was startled by a large snake rearing up and hissing at me. How many times have I written about being careful about snakes in these confluence narratives, and now, in the broad lane, rather than in a field of tall grass or cactus, did I finally encounter one? Nobody was there to see how far I jumped, and I'm not quite sure myself. However, after making sure that a fair distance existed between me and the snake, I took a photograph and a video so I could show my naturalist friend and colleague later. Was it a rattlesnake or just a large bull snake? I did not hear a rattle, but my friend said that rattlesnakes don't have to make that unique noise when they are startled. After viewing my video, he suspected that the way the snake lifts its tail when it moves indicated that it might indeed be a rattlesnake. At any rate, for obvious reasons I was now feeling a little jittery, but having driven all this way, decided to press onward, due north, between two very large circular fields, clearly visible in the satellite image. The fields are that way because of center pivot irrigation. The track condition worsened and it looked like it had rained within the past 24 hours, with some standing water. Next, the trails diverged along the perimeters of the circles, requiring me to set out along the open but non-irrigated space between fields to the north. After a short distance and about 20 minutes into the hike, I found the confluence point. The confluence lies in an uncultivated field with about 25% bare soil and the rest in yucca, short grasses, some gourds or melons, and unidentifiable plants. I saw a few birds and some cattle in the distance, but no people. The view was fairly long in all directions, though a small rise to the south made the southerly view the shortest. The land is sloping here ever so slightly to the east but is fairly flat, lying on the edge of the Llano Estacado. The predominant land use is grazing and farming, with energy extraction to the east. 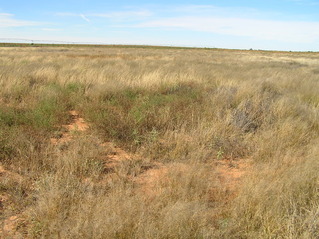 It was around noon in late Fall and in the Llano Estacado, one of the flattest regions of the world. It was early afternoon in mid-late autumn. The temperature was a pleasant 65 degrees F (18 C) under clear skies and a steady wind. It would be quite hot here in midsummer and I was glad to be here in November. I had stood on 33 north latitude several times, from Georgia on the east to California on the west. I had also stood on 103 west longitude several times, from North Dakota on the north to South Dakota, Nebraska, Colorado, and Oklahoma, to this point in Texas on the south. This confluence is rather special because it was very close to a state border, that with New Mexico, just off a few miles to the west. It is amazing that 13 years have passed since the last visit to this site. The confluence is quite easily reachable, with no fences to encounter, but admittedly it is not on a major route to or from any major city. I now have amassed perhaps 15 or so Texas confluences from over 10 years of visits. I was reluctant to depart the area, but I had a long drive back to the Lubbock airport. I was on the confluence site for only 10 minutes but had a nice walk back to the vehicle, even if I was still a bit jittery from the snake encounter. I even filmed a video of my walk through the soil crusts, which made delightful crunching noises owing to the recent rain. The snake had exited the scene, and I arrived at the vehicle. I then drove east, through Denver City, then east to Seagraves, northeast to Brownfield, and northeast to Lubbock. At the Lubbock airport, I bid farewell to West Texas, and hoped that I could return someday. The people, history, geography, and sense of place of the region are all wonderful. It isn't an easy landscape in which to make a living, but the hardy folks who live here care about people and the land in which they are living. #1: Site of 33 North 103 West, in the foreground, looking northwest. #2: Looking west from the powerline at the start of the hike to 33 North 103 West. #3: View to the west from the confluence. #7: Some gourds or melons in the groundcover at the confluence point. #8: All 12 satellites in view from the GPS receiver at the confluence point. #9: Joseph Kerski at the confluence point. #10: 360 degree video with sound filmed at the confluence site (MPG format).